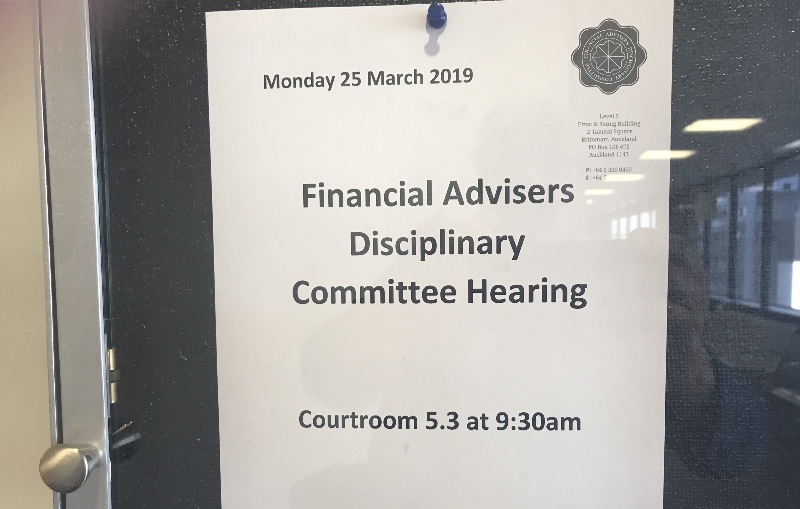 The Financial Advisers Disciplinary Committee has today ruled on Monday hearing Good Returns reported on this week. The adviser at the centre of the hearing lost his case. I think RFAs should be very worried about this decision. It seems the FMA was pretty keen on a scalp in the life insurance sector and it was presented with the opportunity to get one in a way many wouldn't have expected. The adviser at the centre of the case is an Authorised Financial Adviser who did, it appears, a good deal of life insurance. Indeed he specialised in providing cover to people in the building trade. About five years ago he sold some of his book to a Registered Financial Adviser; who then became the complaint in this case. This was based on information for Client 1 who is described in the FADC decision as being "cavalier in a number of aspects of his evidence and surprisingly glib about matters as important as medical disclosure." Counsel representing the FMA, Michael Hodge, admitted to the FADC hearing that this case was at the low-end level of alleged offending. It's "not a high end case," he said. "It's at the lesser order of seriousness,"
It's interesting that in the eight years since the FADC was established it has only produced 12 decisions in nine cases. With this track record you can argue that the AFA population in New Zealand has been pretty well behaved. Originally seven charges were alleged, but when it came to the hearing that had reduced to two and also the FMA withdrew charges alleging a breach of Code Standard 12 and limited them to CS 8 (the old version) which related to not keeping good records. At the hearing there was no shortage of documents, indeed there were two rather large bundles of documents. Perhaps most concerning is that some of the client documents had been destroyed at some time after the books of business were sold. It's worth pointing out too that there was no advice expertise amongst the three committee members who heard the case; Two were from the legal profession and the third's career was "focused on providing investment research to fund managers’ globally." Start electronically recording all of your interactions with clients because, when push comes to shove, the blame could very well be yours no matter how many 50 page Statement of Advice documents you write. This is the first insurance case before FADC. If the adviser had not been an AFA, I doubt that he would have been facing any discipline at all. Also i understand the AFA may have been complained about by the RFA he sold his insurance book. Phil also gives a warning that if you sell your book to anyone, make sure you keep a full copy of all files that you pass over to the purchaser. Par 25 they say "In the context of this case, dealing with insurance advice, we consider that the risk profile in question is not just the client's tolerance for investment or insurance risk but the risk profile they present as a potential insured. Under the new code, this sort of stuff will apply to all financial advisers. WOW. Next we will need to provide a written supplement to every piece of advice as to how exactly we have taken into account each Code Standard explicitly in that advice. The FMA did a disastrously bad job on my case and the hearing was all going one way (mine) as at lunchtime. So in the afternoon the Committee took over the ‘prosecution’. Points that were common ground in the hearing, like that I took Mr P through the health statement in the application, still appear to be a matter of contention in the written decision. The committee also pulled out evidence that wasn’t even covered in the hearing to weave into their decision. They found appointment records in the evidence with a 30 minute duration and assumed that my appointments were set for this timeframe. Had they asked me on the day we would have produced evidence that all of my appointments for that year were 30 minutes duration. My staff set the start time and left the default 30 minute duration as they didn’t know how long appts would go. Even Mr P confirmed that the first appointment went for up to 45 minutes. The client swore that I rushed him through the application at the second appointment without giving him a chance to read it. I produced categorical evidence that client signed up at a third appointment and had 10 days to read the SOA. The committee was happy to take the client’s ‘rushed’ description of the second appointment and apply this, without evidence, to the third appointment the client didn’t even remember happening. You are correct that the RFA I sold the book to was the original complainant. He breached multiple CS’s when he moved these clients to another insurer - but he isn’t bound by the code so he could safely poke the stick. I strongly encourage all AFA’s and RFA’s to read the decision and concentrate on Mr P’s facts. If you can see where I stepped over the line please tell me? If you’ve ever sent an application for a client to complete in his/her own time I assume you have breached the code for failing to suitably advise the client of disclosure requirements? I did so much more than that but am still in breach apparently. Would be interested to hear from the lame duck Code Committee as the clock ticks ever closer to their "Don't come Monday" or "used by date" on what they think of the FADC's definition expansion of "risk profile". My two cents and some of it won't be appreciated. I get that. I'm not going to comment on the evidence, it is what it is and I don't have access to it to review it. So I'll leave that alone. However, on the whole, reading through this I side with the respondent that the interpretation of the adviser requirements is potentially unreasonable. And if this is unreasonable for an AFA, then most RFA's have some significant issues to be concerned about. The process described in the report suggests that time and impatience was a contributory issue, what I did not get from this is the context of the environmental situation. If in the workplace, were there ears listening? did this have a bearing on the quality of disclosure for the respondent, or was it purely an issue of haste? What I won't be popular with saying is the comments around risk profile as a measure of risk to the insurer is somewhat on target. Underwriters and insurers consider advisers to be the first underwriter of the client, assisting them in ensuring the picture of the client is the picture of the client. This is why we have the section 10 requirements under insurance law about disclosure to an adviser is disclosure to the insurer. However, while there is a practical issue in the decision that is relatively easy to manage with investments, it is considerably more difficult with insurance. And that is the due diligence expected to verify the information provided by the client with external sources. For things like income and financial positions, fairly easy, authorities for access to Bank accounts, Financial statements with Accountants and ACC. On the financial side where this gets difficult is with accessing information from the IRD and other financial institutions that are not quite so adviser friendly. Though more pertinent to this case is the issue of medical information. We have enough trouble with insurers accessing medical information from medical people, having advisers do this is frankly unworkable. And without the client's authority to access information, the adviser is unable to verify any external sources on the medical side. The D&C signed on the application does not give this authority to the adviser. This decision has the potential to set the expectation that advisers need to submit medical notes with applications to ensure they have done their due diligence. Which creates all sorts of havoc. If the adviser is requesting medical notes, the clients are going to get push back from medical staff as their revenue from these requests is going to be impacted, resulting in clients paying for their information. Because the adviser now has the medical information from the client, they are going to have to manage this to ensure those notes are sent to the provider. Which raises the risk of things being missed int he volume of information, especially if a client has removed a page or two they don't like before handing them over. (Who then removed the page, becomes an extension of this whole argument). This increased volume of paper will then create additional backlogs and storage issues on both sides as the underwriters have to wade through great volumes of unneeded information and this will dramatically slow the whole process down. Looking for another way to kill the life industry and drive life insurance that is not underwritten, this sounds like a great plan if this is to set a precedent on adviser expectations for due diligence. JP. I do not read the FADC decision as 'requiring verification' of all that the client discloses, merely that if there are issues the adviser is aware of, these are disclosed. And yes, the advisers have a duty to actively ask for details but no duty to verify these are correct, just that they are disclosed. The respondent in this case probably would have been ok on the second client, MR W, if Mr W had disclosed the Sovereign exclusion by answering the question on the Partners Life Policy correctly, after pressure as may have been necessary by the adviser to do so.